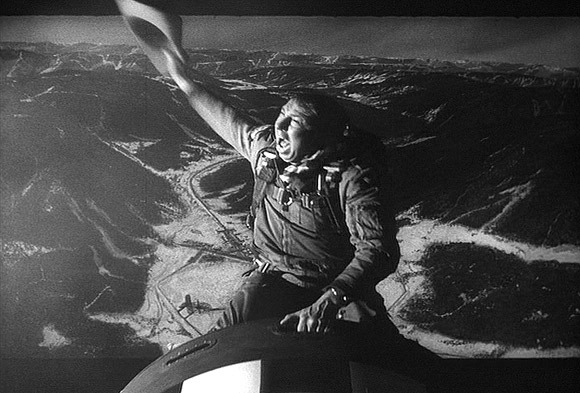 So, Doctor Strangelove and A Fistfull Of Dollars were the big hitters this year, two classic movies and two worthy winners. My Nominations: The Fall Of The Roman Empire. The Outrage. Fail-Safe. Zulu. So far this category seems to find epics picking up the most nominations – this is hardly surprising given the natural size of the cast required and the fact that epics of the 60s always had more than their fair share of A-list performers. Two of my four nominees this year are epics, will the remaining half showcasing that rare moment when a relatively small cast pull together to make a perfect whole. 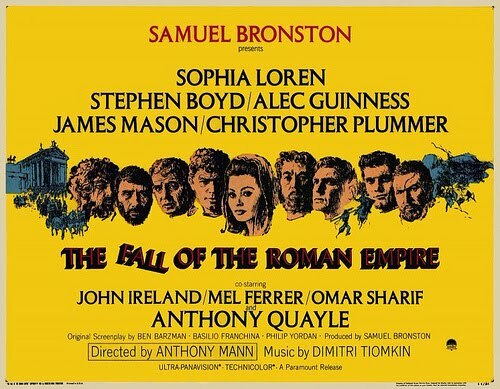 The Fall Of The Roman Empire features the likes of Alec Guiness, Omar Sharif, James Mason, Christopher Plummer, Ballyclare’s own Stephen Boyd, and of course, Sophia Loren while Britain’s attempt Zulu sees Michael Caine, Jack Hawkins, Stanley Baker, James Booth, and Richard Burton pulling together. Fail-Safe is a much smaller affair and features the quintet of Henry Fonda, Dan O’Herlihy, Walter Matthau, Frank Overton, and Larry Hagman, while Rashomon remake The Outrage collects the likes of Paul Newman, Eddie G Robinson, Lawrence Harvey, Claire Bloom, and William Shatner. Which film of 1964 do you think featured the Best Cast? Let us know in the comments below! My Nominations: 633 Squadron. Goldfinger. A Fistful Of Dollars. Zulu. With each passing year, Hollywood writers, directors, and stunt performers grew more ambitious and adventurous with their stunt ideas. 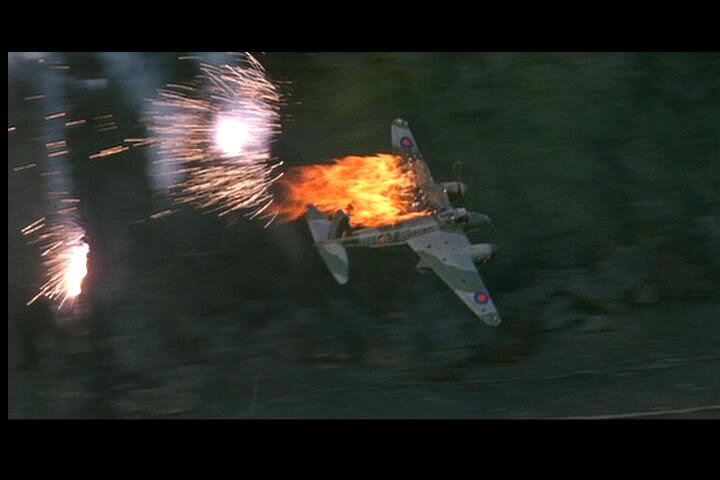 633 Squadron became a perennial British Christmas hit and the aerial battle scenes remain some of the most impressive ever filmed. The film lacked a huger star though and was not a big commercial hit. John Crewdson and Joe Powell are the uncredited geniuses here. Both men again had illustrious careers but are barely remembered. Zulu raised the bar for sheer scale of ground battle scenes, and while there are no obvious single outstanding stunts, the onslaught of fighting and action on screen at any given time must have been hell for the stunt crew and director to manage. Joe Powell again gets in on the act with John Sullivan providing stunt direction. A Fistfull Of Dollars features plenty of stylized gun play with Benito Stefanelli acting as co-ordinator and stuntman, becoming the go to guy for Spaghetti Westerns. Goldfinger features many of Bond’s most famous setpieces – the laser table, the aerial scenes, the DB5 ejector seat and crash, and of course Bond’s fight with Oddjob. Bob Simmons and his large crew are to thank for some wonderful moments. Which movie from 1964 do you feel has the best stunt work? Let us know in the comments! Actual Nominations: Mary Poppins. The 7 Faces Of Dr. Lao. While not necessarily and landmark year for visual effects, the 2 official nominations show advancement of the field and hold scenes which are still outstanding today. For the flight mechanics, merging of animations and other pieces, Peter Ellenshaw, Hamilton Luske, and Eustace Lycette won the award for Mary Poppins. 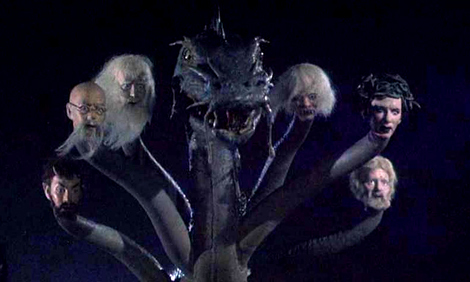 As much as Mary Poppins did for visual effects, The 7 Faces Of Dr. Lao blows the competition out of the water. The invention on display is superb, but it is the variety of effects which cement this as my winner. On a much lesser budget than Disne’ys extravaganza, Jim Danforth’s exemplery stop motion work reflects the crazed mind of an escaped, under-your-bed lunatic. 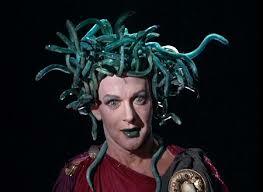 The work forshadows later films such as Clash Of The Titans, but the wizardry here is exquisite. My Winner: The 7 Faces Of Dr Lao. My Nominations: Mary Poppins. The 7 Faces Of Dr. Lao. Goldfinger. Mothra Vs Goldzilla. 633 Squadron. Added to my nominations come three films of varying effects bonanza-ing. Goldfinger arguably begins the love affair between Bond and gadgets, M vs G has a number of catastrophic fights between the Titans, while 633 Squadron features realistic air battles. It seems odd to me that any of these 3 films were left out of the official nominations. Who is your pick for the best visual effects of 1964? Let us know in the comments! Jeepers, I can’t wait to get out of the 60s so that some decent movie songs can be discussed. Henry Mancini’s Dear Heart almost strangles his excellent work from The Pink Panther and is yet another whiney, choral-voiced, meandering and dreary love song. There’s nothing offensively bad about it, and I’m sure my opinion is in the vast minority, but any time I hear songs of this style I am instantly sent into a momentary depression. Hush Hush Sweet Charlotte is better though, gentle, bland, but goes absurdly against the plot, tone, and style of the film. 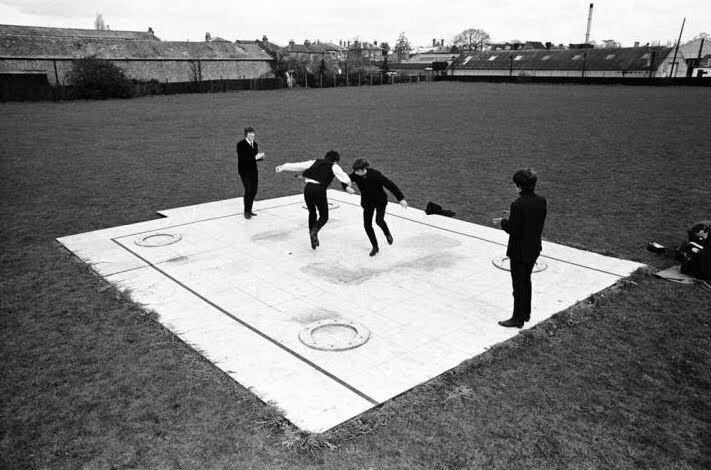 By this point you can probably guess what I’m going to say about Where Love Has Gone– I do enjoy the overblown strings of the intro, but it’s just another whiney love song about nothing with music which doesn’t merge well with the (bland) vocals. Luckily, My Kind Of Town is better, but unluckily it’s another swing song which is a type of music which I cannot listen to for more than 2 minutes before wanting to pull out my eyes and insert them in my ears so I can watch myself going deaf. So, it is with no delight that my winner matches the official one- Chim Chim Cher-ee. Again it goes against everything I like in movies and music, but it certainly isn’t bland or whiney. It’s fun, funny, clever, the lyrics fit the plot, the music fits the vocals, the performance fits blah blah. The children vocals however are awful, but luckily they don’t last long. My Nominations: Viva Las Vegas (Viva Las Vegas). Supercalifragilisticexpialadocious (Mary Poppins). Goldfinger (Goldfinger). 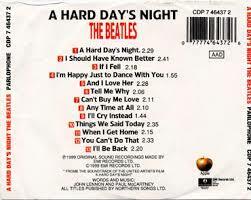 Can’t Buy Me Love (A Hard Day’s Night). Wouldn’t It Be Loverly (My Fair Lady). So, I’ve managed to pick entirely different songs from the official nominations-some of which could be said to have been a huge oversight. I still managed to select 2 songs from the two winning films- Superblabladoshus, a fine nonsensical song which retains the ability to charm kids of any generation, and Wouldn’t It Be Loverly which is a loverly song. Aside from those, my choices see Elvis on fine form with Viva Las Vegas – a hurried verse followed by blasting chorus which is now synonymous with the city, and Shirley Bassey’s epic first entry in the Bond series- the sensual classic, Goldfinger. Either of those tracks are deserving winners in any year. 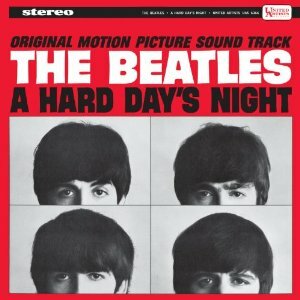 However, my win has to go to The Beatles; it’s a case of ‘take your pick’ from A Hard Day’s Night as every song is a winner. My favourite though is Can’t Buy Me Love, one of the best pop/rock songs ever. Let us know in the comments what your favourite song from a 1964 movie was! Finally, in 1964, an award was presented for the first time in the field of make-up. It may have only been an honorary award, but it was a step in the right direction although it would take a depressing 17 years before the category became official. William J Tuttle had been responsible wholly or in part for the make up in films from the 1930s to the 1970s- if you haven’t heard his name then I’m sure you’re familiar with his work- The Wizard Of Oz, The Red Badge Of Courage, Singin’ In The Rain, The Prisoner Of Zenda, 7 Brides For 7 Brothers, Forbidden Planet, North By Northwest, The Time Machine, The Twilight Zone, Young Frankenstein to name a very few. His award for 7 Faces of Dr. Lao is justified and deserved in itself, but gives thanks to one of the greatest undervalued careers in Hollywood. My Nominations: 7 Faces Of Dr. Lao. The Fall Of The Roman Empire. Goldfinger. The Flesh Eaters. Onibaba. Zulu. The Masque Of The Red Death. A mix of horror, action, and epics make up my picks this year. Zulu and The Fall Of The Roman Empire are obvious choices given the scale and dedication involved, while Goldfinger continues the trend of strong work for Bond films. Onibaba is made all the more flesh-crawling due to the subtle make-up- it’s so subtle I don’t even know who the make-up artist was. The Masque Of The Red Death and The Flesh Eaters go for a more visceral approach and while both relatively low budget, they show a supreme mastery of the craft and ability to make the craft a vital part of the production. My Winner though has to be 7 Faces Of Dr. Lao as it is genuinely revolutionary. There are techniques and sights on display here that were new, and others brought to the tip of their power, but it is the diversity and invention which overshadows the other nominees and shows a great man going wild with his art. My Winner: 7 Faces Of Dr. Lao.